It goes without saying that in general Toyota’s Camry is the automotive equivalent of warm milk laced with Ambien. Contrastingly, today’s Nice Price or Crack Pipe All-Trac is ugly enough to keep you up at night, but is its price worth losing sleep over? Trying to sell a heavily customized car or truck is akin to attempting to get someone else to wear your broken-in tighty-whities. While they may fit you like a bun-hugging glove, others might take exception to something molded to your personal taste quite so closely. That’s the only reason I can come up with for why yesterday’s amazing custom 1973 Chevy El Camino - colorfully dubbed El Cedes - dropped in a 70% Crack Pipe loss. For $12,000, What The El? Instead of custom cars, maybe it’s time to take stock of something. . . well, stock. And what better candidate than what is arguably one of the most interesting models of what is inarguably one of the world's least interesting cars? 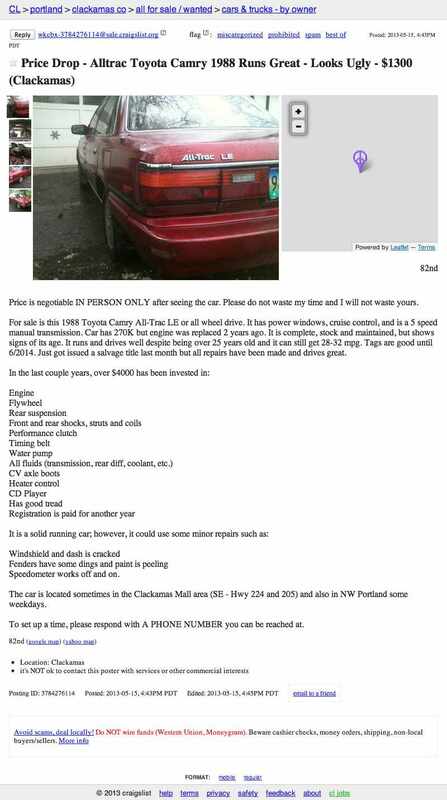 Today, for your consideration we have a 1988 Toyota Camry sedan. Man, I never expected to write those words, in that order. I’m feeling like I might nod off just re-reading them. But wait, this isn’t just your garden variety Camry! No, this is the variety of Camry that could potentially dig donuts in said garden, and lay down some secure if not thrill-inducing handling during inclement weather. That’s because this burgundy four-door is that rarest of rare models, the All-Trac. The best known of Toyota All-Trac models is probably the Celica All-Trac turbo. To put things in context, that rally-bred coupe was the more athletic model, likely having lettered in high school and still able to run with the big dogs today. By comparison, the Camry All-Trac was the more sensible sibling. That’s the one that appreciated the security of all-wheel-drive when heading to chess club on rainy days. Today it enjoys reruns of Law and Order- you know the good one, with Lenny, not that skanky SVU one with the characters who mumble and can’t be bothered to stand up straight. Deplorable. The ad says that this Camry All-Trac has a remarkable 270,000 miles under its belt. Don’t fret though because just two years ago its engine was replaced. The ad also notes that the car has been reasonably maintained over its life, and that it currently runs well with everything - cruise, power window winders, etc - working as you would expect. That’s not surprising as this is an ‘80s Toyota which have gained the rep for having the half life of Caesium-135. Unfortunately time and use have apparently not been kind to the car’s appearance, as the seller uncharitably describes it as ugly. Overall it doesn’t look too bad in the pictures. Oh sure there’s a busted tail lamp, and the dashboard looks like the scene of a WWF Smackdown, but it’s all serviceable. The Ruby Tuesday velour interior is somewhat soiled, and it has those nasty mouse belts, but neither of those are probably deal killers. There is something about this car however (I mean, other than it just being a Camry) that might just sour your opinion of it. Just like there are two things that will ensure you don’t get a second date, there are two factors about pretty much any car that will guarantee a Crack Pipe vote. When it comes to dating, the statements “Mom says there’s nothing wrong with a grown man breastfeeding” and “I like cats” are locked-in assurances of your forever alone-ness. I mean, except for mom and the fluffster. Similarly, possessing an autotragic gearbox is typically seen as a deal killer for NPOCP. This Camry rocks a five-speed stick, so it’s okay on that front. It is however, tainted with that second almost universal indicator of uncleanliness, a salvage title. I know, and it was all going so well. What the hey, it’s only $1,300 right? Plus the ad says that the seller has recently dropped the price like the bass. Well, now is the time for you to put no-money where your mouth is, and vote on whether you think this Ugly Camry is worth $1,300 in pretty, pretty cash. What do you think, is this All-Trac worth all that dough-rey-me? Or, is this all-wheel-drive Camry just not all that? 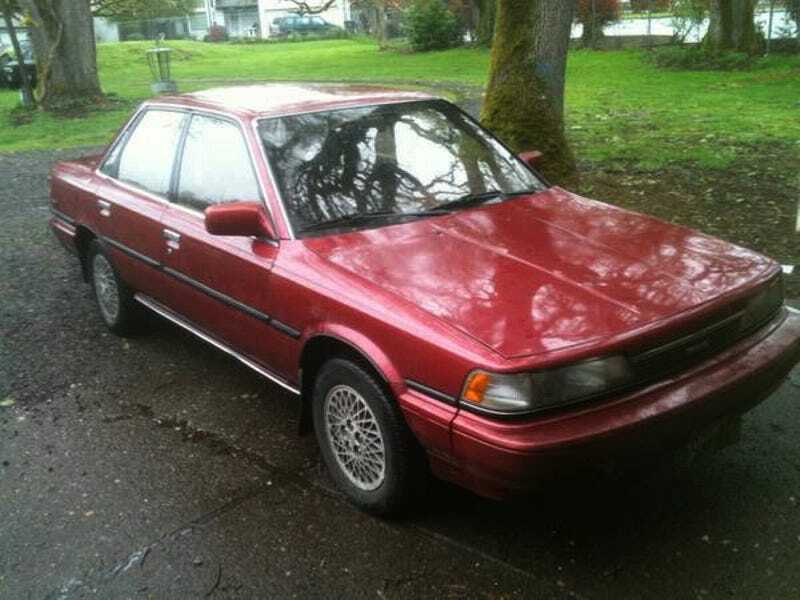 At $2,900, Could This 1988 Toyota Camry AllTrac Be All That?